Dr. Morton: We know that childhood cancer survivors, particularly those who received radiotherapy to the chest, have strongly increased risk of developing breast cancer. We studied about 3,000 female survivors of childhood cancer to identify whether inherited genetic susceptibility may influence which survivors go on to develop breast cancer. 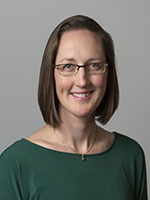 Dr. Morton: In this discovery study, we found that specific variants in two regions of the genome were associated with increased risk of breast cancer after childhood cancer among survivors who received 10 or more gray of chest radiotherapy. A variant at position q41 on chromosome 1 was associated with nearly two-fold increased risk and one at position q23 on chromosome 11 was associated with a more than three-fold increased risk for each copy of the risk alleles. However, the variant alleles didn’t appear to have an effect among survivors who did not receive chest radiotherapy. Dr. Morton: Because this is a discovery study, replication of our findings in independent populations is very important. Also, as with other genome-wide association studies, the regions of the genome that we identified represent markers of risk. Laboratory follow-up will be required to clarify the underlying biologic mechanisms of action, accounting for varying levels of radiation exposure. After confirming the findings in other populations and better understanding the specific variants in the genome that are responsible for the associations, we hope that in the future the results could be used to more precisely identify the risks and benefits of specific treatments for patients at the time of childhood cancer diagnosis. In addition, for patients who have already been treated, the results could be used to identify the survivors who have the highest risks of developing breast cancer and therefore might benefit the most from increased screening. This entry was posted in AACR, Author Interviews, Breast Cancer, Cancer Research, Pediatrics, Radiation Therapy and tagged pediatric cancer by Marie Benz MD FAAD. Bookmark the permalink.